Timogix Blog | The blog for Timogix online timesheet software. Categories include enhancements, tutorials, news, events, etc. relating to Timogix. The February release had an update to the existing dashboards. The update gives the user and manager a clear view of what time has been entered by week or month by their team. The dashboards have been broken out into two tabs. The first tab gives a user view of time for the month. By selecting a user or month you can change what data shows. On the left is a quick view of the users information including who can approve or who this user can approve. The top numbers give a quick view of what time has been submitted, pending approved, or approved. The second tab has two child tabs.The first child tab is a weekly view of time for users who you have been given access too. You can drill down into each row to see where the time was allocated by client, project, and task. The second child tab is a monthly view of hours across users and clients. To determine who can see what data on the dashboard three new permissions were created. By selecting one of the permissions shown below, you determine what data should be shown to the user. After many customer requests for this enhancement, timers are now available. This will allow your users to start and stop time on tasks from their timesheet, thus allowing for more accuracy in time tracking. To start a timer click on the blue clock icon in the top right corner of a timesheet row. If the blue clock icon is not showing it is because the row is disabled or timers have not been enabled by your administrator. So if you do not see a blue clock icon and your timesheet row is enabled for editing, then see your system administrator to have this functionality turned on. Once the blue clock icon is clicked the timer will be opened. Then click the green start icon which will start the timer. The timer will continue to run regardless of whether you close your browser or not. When you are ready to move the time into your timesheet click the white arrow icon shown below and you can then select which day you would like to move the time into. See the below screenshot for details. Tracking of PTO (paid time off) accruals is now available in Timogix. You configure how many days of accrual each employee gets and at what intervals they receive PTO. Once an employee has been given PTO they can view their PTO balances in the benefits tab located in the my settings area. Also a new PTO report was added which will allow for a user to see their accrual balance or balances of any users they can approve. So the user knows how much PTO they have available they can view their current balance in the new benefits tab located in the my settings area shown below. This user receives 10 PTO days per year and has a current balance of 4.27 PTO days. The ability to add expenses to a timesheet is now available. To turn expenses on navigate to Setup --> Settings --> General Defaults --> Check the "Allow expenses to be created" checkbox. Expenses follow the same approval process as timesheets. So when a timesheet is submitted or approved the expenses are submitted or approved as well. A new expense report has been added to view the expenses by date and client. Also the expenses will flow into any invoices you create. Creating expenses are easy. Click the green circle next to the "Expenses" text and it will open a window to add or edit an expense. When in the expense window you can select the correct expense type (which you can adjust), cost and then optionally add receipts if needed. See the screenshot below of an expense that is being edited. An expense report was added to see all expenses. You must be a have the user administration privilege to view this report. See below for a screenshot of the new expense report. What is your Profit Margin? From a customer request an additional report was added to determine the differences between your costs per employee versus the cost billed to the client. Effectively giving you a quick view of your profit. The below report shows the User Cost vs Billable Cost report. This report can be filtered by data, user, client, and expense type which gives you the ability to focus on where your profits or losses are. Computing billable cost versus user cost comes from the billing rates you input on a user and/or project level. Then the number of hours entered by the user is calculated against the billable rate and cost rate to determine the difference. Different companies and industries use different terms when relating to work or services. An example is a business may use the term "Account" instead of "Client". By default Timogix uses the terms Client, Project, and Task. So to make these terms more customizable to fit your business these terms are now adjustable. See the screenshot below which can be located in the settings area if you are an administrator. To adjust the terms for your business just enter the term under the "Your Verbiage" section and these terms will then flow into all viewable areas of Timogix, such as reports, email notifications, etc. To make it even easier to enter time a mobile enhanced timesheet will be released Nov 7th. The enhanced view can be used to enter time on any mobile device. Below is an example timesheet week view. Notice that the user can switch back to the non-enhanced view by clicking the "Desktop view" link located at the top of the page. This mobile enhanced timesheet can be turned on by your administrator. The screenshot below shows a section called "Allow mobile timesheet access". If this is checked the mobile timesheet view will be accessible by all mobile users to your company. We have had many requests for QuickBooks integration and it is finally here! 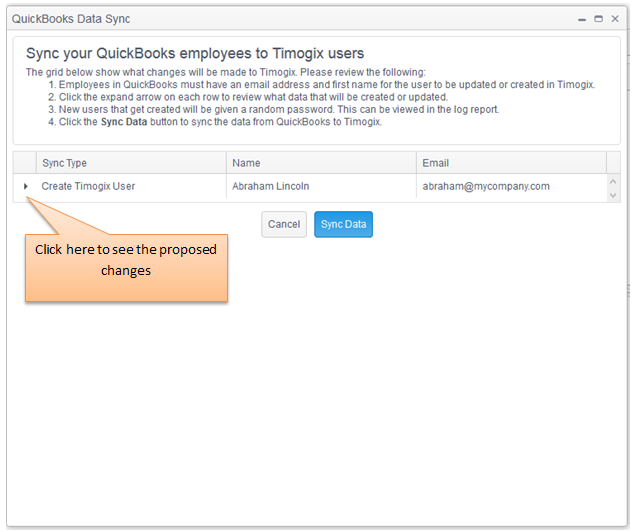 Timogix now allows you to synchronize data to and from QuickBooks using the online version of QuickBooks. The sync process was designed to run you step by step thru the data flow allowing you to verify the proposed changes before anything gets committed. There are two data flows from QuickBooks to Timogix and one from Timogix to QuickBooks. Let's go thru each one. This process will synchronizes employees in QuickBooks to users in Timogix. Employees must have a first name and email address in QuickBooks for it be a valid user in Timogix. The matching process for updating user information is by email address. 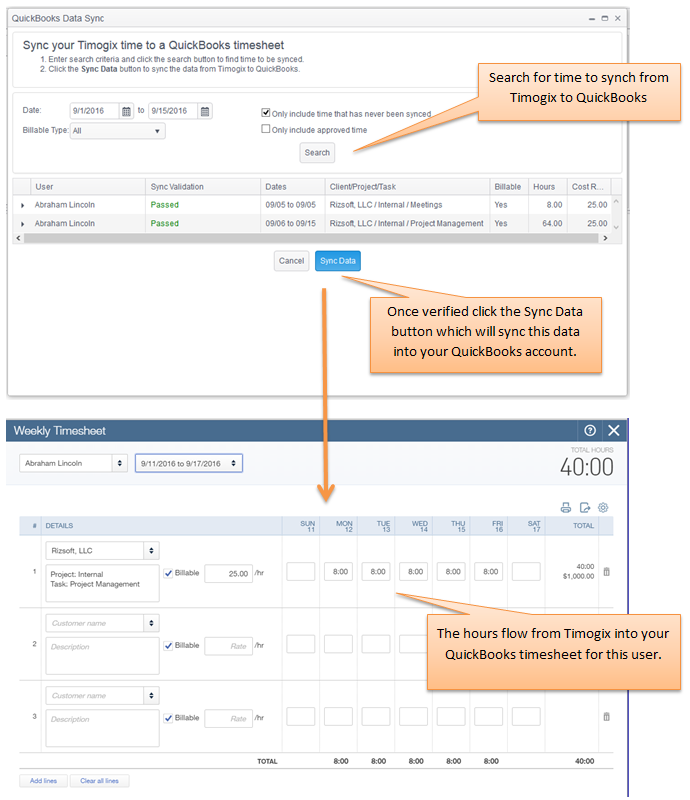 This process synchronizes customers in QuickBooks to clients in Timogix. Customers must have a display name in QuickBooks for it to be a valid client in Timogix. The matching process for updating clients is by client name. When a new client is created thru the sync process, you can optionally have the Timogix system create default projects and tasks so your users can log time against the clients right away. This process allows you to select the time entries in Timogix to be synchronized into your QuickBooks account. More finely tuned task statuses were added in the latest release. This gives an administrator greater control of what days a user can add hours to a task on their timesheet. In this release two enhancements to the task were added. First was adding a start and end date to the task. The date a user is adding time to their timesheet must fall within these dates otherwise the task will be disabled on the user's timesheet. The second enhancement was to enable or disable certain days on a timesheet based upon the day of the week. An example is you have a task that should only have time logged during the week and not on the weekend. In this scenario the administrator can select that this task only have weekday dates enabled. The screenshot below shows the task setup screen and where we can enter a start and end date of the task. Then the administrator also disabled the weekend so only weekdays are enabled on the user's timesheet. The last images is the user's timesheet showing the disabled dates. Notice how the timesheet only allows weekdays to be entered. From a discussion with a current user, a request was made for an easy way to see how many hours an employee logged for a specific month. Currently there are reports that give this information. But the difference was this user preferred to have a quick visual representation of the hours in a calendar view. To satisfy this request a new report called "Timesheet Calendar View" was created. This report shows a calendar with the number of hours saved for each day. This report requires a user administrator privilege to run. The below example screenshot shows the month of January 2016. The hours displayed inside the calendar cells is the number of hours this user (Bill Miller) saved each day. If you search for free timesheet applications you will find so many programs available that it will make your head spin. With so many varieties out there how can you make a selection? Since the scope of this article is on free timesheet programs, that can help narrow down the list some. But if you notice some timesheet programs are not completely free or is limited by functionality or is free for only 30 days. And if your company grows you may need more functionality that would require you to then pay for the program. So some questions you may ask are below and that is why I would recommend you try Timogix. Timogix is free for the first 3 users. Are there restrictions for the free version? There are none except for the 3 users. You can have unlimited clients, projects, invoices, etc..
None. No limitations other than users. No restrictions. No trial period. So my business grows and I have more than 3 users. How much will it cost then? Timogix is $3.00 per user. If you look at most other applications you will pay from $12 - $30 per user. So if you are looking for a completely free cloud based timesheet solution, take a look at Timogix. 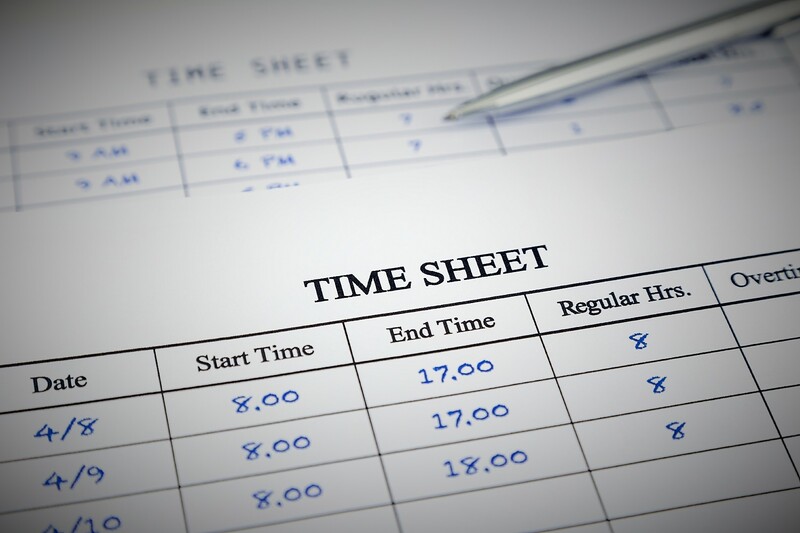 Should your staffing company switch from paper to online timesheets? Timesheets are a critical part of any business. It allows owners and supervisors to track time allocated to each individual project. The age old paper timesheets have been around for a long time. Why? It seems simple and it works. But is it the most efficient way of tracking time? Could online timesheets be more efficient? Should your staffing company switch from paper to online tracking? Companies are still commonly using paper timesheets today. This method is as easy as it is simple for the employee as they only need to write down a few numbers and turn it in. There are a few problems with this however. First someone has to manually approve the timesheets and bring them in from the jobsite. Second the timesheets must be re-entered into software for billing. All of this has potential for human error. Online timesheets can drastically lower this potential for error. Employees will directly enter their time into an online timesheet. There is no transferring of data to worry about. When the time is entered the HR department can instantly see any changes to the system and adjust accordingly. Also many staffing companies are working with several different clients. If you require approval of timesheets from these clients many of the top timesheet programs out there have this. The approval system should be able to send notifications for approval seemlessly behind the scenes. Then when the submitted time has been approved your HR contact should be automically notified. Make sure to ask about online approvals if you need this. Another area online timesheet programs help is a centralized location for all time tracking, expense, and invoicing data. Having a single location to view time is essential for helping your HR department do payroll in an effecient manner. Many times staffing companies have employees at remote locations. By having a centralized location for time entry you can keep track of what your employees or contractors are working on. When looking at different timesheet solutions, pay special attention to the reporting that is available. Determine if the reporting will work for your business. And if it doesn't, is the software provider flexible where they are willing to customize the system to fit your needs? As you can see, online timesheets are far more efficient and accurate way of tracking employee's time. Take a look at Timogix which provides a secure timesheet solution for your business. An enhancement requested by users was to allow the ability to save documents to the system. As of the February 2016 release this has been added. This enhancement allows a user with appropriate security privileges to upload documents in three areas. If a user has user administrator privileges they can upload documents for a user. If a user has client administer privileges they can then upload documents to the client or project. The below image shows an example where two documents have been uploaded to a client. We are always striving to make the Timogix system better by getting feedback from customers. Some of this feedback was related to customizing the look and feel of the application so it can resemble the company. So as of the February 2016 release the business name can be adjusted. This allows an administrator to change the text to your company name located at the top left of the website header. The image below shows how the company, URL, and text size of the logo can be changed. This is the first of a few enhancements that will allow the administrator to customize the screen. The next customization enhancement scheduled for a summer 2016 release will allow an administrator to customize the look and feel of outgoing emails. Do you ever have users who habitually fail to submit their timesheet? This is a common problem for many businesses. 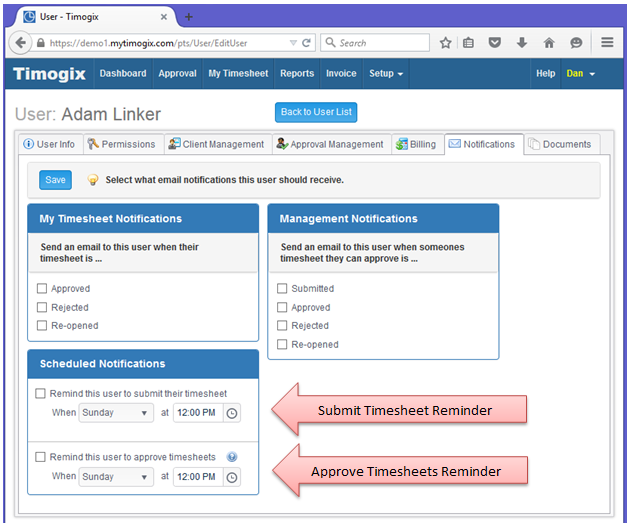 To help out these users Timogix has added scheduled notifications that will send an email notification reminding the user to perform an action such as submitting their timesheet. Two scheduled notifications have been added. Scheduled notifications are different from the existing notifications as these notifications are weekly and you as an administrator or the user can adjust what day and time they will be sent out. The first scheduled notification is the submit your timesheet reminder. This will send an email to the user on a weekly basis reminding them to submit their timesheet for approval. The email will contain a link which will take them to their most current timesheet that needs submitted. The second scheduled notification is the approve timesheet reminder. This will send an email to an approver on a weekly basis if they have timesheets to approve. If there are no timesheets then no email goes out.